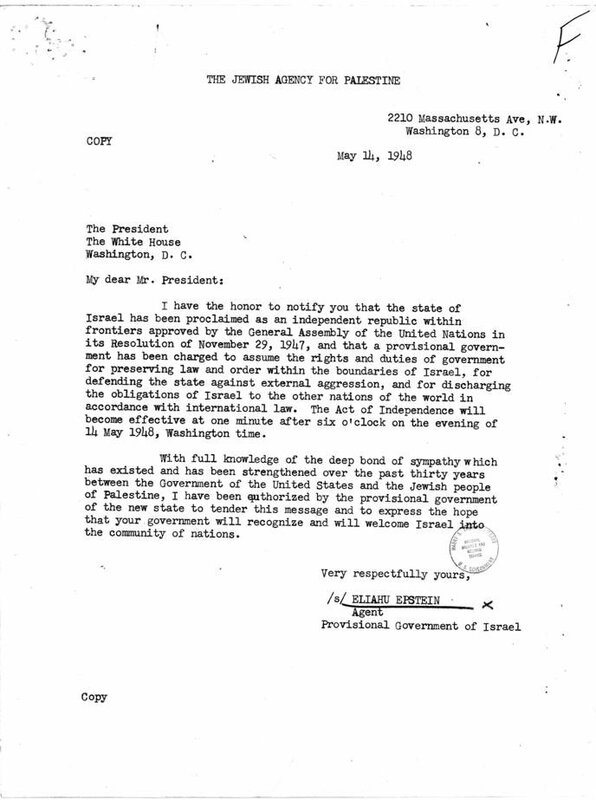 The letter sent by the Provisional Government of Israel to the President of the United States, announcing the Declaration of the State of Israel, confirming the frontiers as those specified in the 1947 UN Partition Plan, and requesting recognition. The reply, with some other documents, is also included. Retrieved from the Truman Library, http://www.trumanlibrary.org/whistlestop/study_collections/israel/large/documents/newPDF/49.pdf, on the 19th November 2012. The image below is taken from the document. …outside the declared and recognized borders of Israel. The Arabs chose not to recognize the borders, so we will set our own- as we want, where we want, when we want.